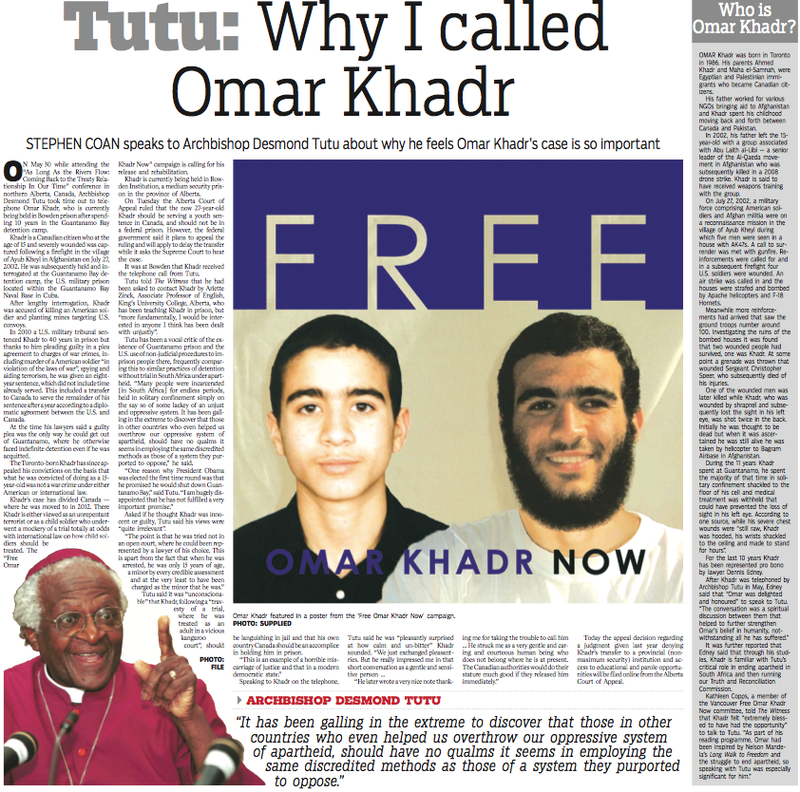 ON May 30 while attending the “As Long As the Rivers Flow: Coming Back to the Treaty Relationship In Our Time” conference in northern Alberta, Canada, Archbishop Desmond Tutu took time out to telephone Omar Khadr, who is currently ­being held in Bowden prison after spending 10 years in the Guantanamo Bay ­detention camp. Khadr is a Canadian citizen who at the age of 15 and severely wounded was captured following a firefight in the village of Ayub Kheyl in Afghanistan on July 27, 2002. He was subsequently held and interrogated at the Guantanamo Bay detention camp, the U.S. military prison located within the Guantanamo Bay ­Naval Base in Cuba. After lengthy interrogation, Khadr was accused of killing an American soldier and planting mines targeting U.S. convoys. In 2010 a U.S. military tribunal sentenced Khadr to 40 years in prison but thanks to him pleading guilty in a plea agreement to charges of war crimes, including murder of a American soldier “in violation of the laws of war”, spying and aiding terrorism, he was given an eight-year sentence, which did not include time already served. This included a transfer to Canada to serve the remainder of his sentence after a year according to a diplomatic agreement between the U.S. and Canada. At the time his lawyers said a guilty plea was the only way he could get out of Guantanamo, where he otherwise faced indefinite detention even if he was acquitted. The Toronto-born Khadr has since appealed his convictions on the basis that what he was convicted of doing as a 15-year-old was not a war crime under either American or international law. Khadr’s case has divided Canada — where he was moved to in 2012. There Khadr is either viewed as an unrepentant terrorist or as a child soldier who underwent a mockery of a trial totally at odds with international law on how child soldiers should be treated. The “Free Omar Khadr Now” campaign is calling for his release and rehabilitation. Khadr is currently being held in Bowden Institution, a medium security prison in the province of Alberta. On Tuesday the Alberta Court of ­Appeal ruled that the now 27-year-old Khadr should be serving a youth sentence in Canada, and should not be in a federal prison. However, the federal government said it plans to appeal the ruling and will apply to delay the transfer while it asks the Supreme Court to hear the case. It was at Bowden that Khadr received the telephone call from Tutu. Tutu told The Witness that he had been asked to contact Khadr by ­Arlette Zinck, Associate Professor of English, King’s University College, ­Alberta, who has been teaching Khadr in prison, but “more fundamentally, I would be interested in anyone I think has been dealt with unjustly”. Tutu has been a vocal critic of the existence of Guantanamo prison and the U.S. use of non-judicial procedures to imprison people there, frequently comparing this to similar practices of detention without trial in South Africa under apartheid. “Many people were incarcerated [in South Africa] for endless periods, held in solitary confinement simply on the say so of some lackey of an unjust and oppressive system. It has been galling in the extreme to discover that those in other countries who even helped us overthrow our oppressive system of apartheid, should have no qualms it seems in employing the same discredited methods as those of a system they purported to oppose,” he said. Asked if he thought Khadr was innocent or guilty, Tutu said his views were “quite irrelevant”. Tutu said it was “unconscionable” that Khadr, following a “travesty of a trial, where he was treated as an adult in a vicious kangaroo court”, should be languishing in jail and that his own country Canada should be an accomplice in holding him in prison. Today the appeal decision regarding a judgment given last year denying Khadr’s transfer to a provincial (non-maximum security) institution and access to educational and parole opportunities will be filed online from the Alberta Court of Appeal. OMAR Khadr was born in Toronto in 1986. His parents Ahmed Khadr and Maha el-Samnah, were Egyptian and Palestinian immigrants who became Canadian citizens. His father worked for various NGOs bringing aid to Afghanistan and Khadr spent his childhood moving back and forth between Canada and Pakistan. In 2002, his father left the 15-year-old with a group associated with Abu Laith al-Libi — a senior leader of the Al-Qaeda movement in Afghanistan who was subsequently killed in a 2008 drone strike. Khadr is said to have received weapons training with the group. On July 27, 2002, a military force comprising American soldiers and Afghan militia were on a reconnaissance mission in the village of Ayub Kheyl during which five men were seen in a house with AK47s. A call to surrender was met with gunfire. Reinforcements were called for and in a subsequent firefight four U.S. soldiers were wounded. An air strike was called in and the houses were strafed and bombed by Apache helicopters and F-18 Hornets. Meanwhile more reinforcements had arrived that saw the ground troops number around 100. Investigating the ruins of the bombed houses it was found that two wounded people had survived, one was Khadr. At some point a grenade was thrown that wounded Sergeant Christopher Speer, who subsequently died of his injuries. One of the wounded men was later killed while Khadr, who was wounded by shrapnel and subsequently lost the sight in his left eye, was shot twice in the back. Initially he was thought to be dead but when it was ascertained he was still alive he was taken by helicopter to Bagram Airbase in Afghanistan. During the 11 years Khadr spent at Guantanamo, he spent the majority of that time in solitary confinement shackled to the floor of his cell and medical treatment was withheld that could have prevented the loss of sight in his left eye. According to one source, while his severe chest wounds were “still raw, Khadr was hooded, his wrists shackled to the ceiling and made to stand for hours”. For the last 10 years Khadr has been represented pro bono by lawyer Dennis Edney. It was further reported that Edney said that through his studies, Khadr is familiar with Tutu’s critical role in ending apartheid in South Africa and then running our Truth and Reconciliation Commission. When Archbishop Desmond Tutu came to Fort McMurray last weekend, Alberta’s oilsands and native rights were his major concern. But in the days before the conference, the Nobel Peace Prize winner and human rights activist added a small personal task to his busy schedule. After a press conference on Friday May 30, Tutu found a quiet corner and placed a phone call to Bowden prison where Omar Khadr, 27, held in Guantanamo prison for 10 years, was waiting … → Read more here.